For and by non-binary people and womxn. 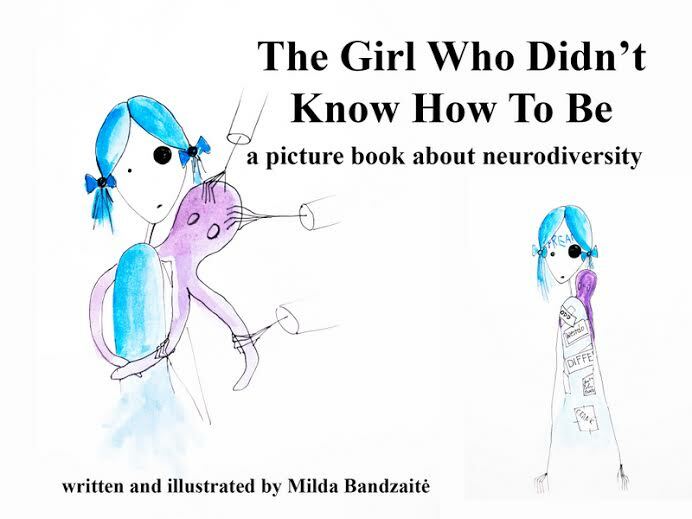 Milda Bandzaite, the artist behind AIWS, has just launched a Kickstarter campaign for their new book project, which promotes neurodiversity through art. Being familiar with Milda’s art which interrogates speciesism, hetero and cis sexism as well as ableism, we were keen on getting in touch with them to find out more about this exciting new project. And we are so grateful, Milda, that you found time to speak to us! [ASW] Tell us about the new project. [MB] So, my next project is a picture book about neurodiversity. 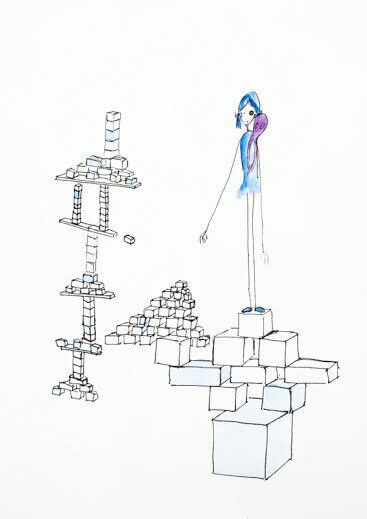 The story itself and all illustrations are ready, I just need to finalise the design for printing. I’m really excited, but extremely nervous at the same time about the project as it’s much more than bringing my book to life: It is a good way to start a dialogue about neurodiversity and what it means to be a neuro-atypical person in a neurotypical world. Another part of the project is the video which is much more than a usual kickstarter video. It is a piece of art on its own. Maxi (Jake Maxwell) who filmed and directed the video did a fantastic job. It was great working with him as well as with everyone else involved. I think the video is not only illustrating the book, but also sending a message to the world. [ASW] To most people neurodiversity is a very new term. In social justice movements it’s not very mainstream to speak of neurodiversity, even when we are concerned with deconstructing ableist structures in our own activist circles. Would you mind explaining what the word implies? [MB] The concept of neurodiversity basically means that everybody in this world has different brains. It’s a proven fact and not an opinion or belief. There is also the Neurodiversity Movement that is a social justice movement for the equality, respect, acceptance and full inclusion for the neurodivergent. It states that it’s ok to have different brains from the majority of the population – neurotypicals (that would fall under the umbrella term that others call “normal”). [The Neurodiversity Movement also believes] that there is no “wrong” or “right” way of being and thinking – just different from the majority. Neurodiversity is just another form of all other human diversities. Unfortunately, not everyone thinks like that and lots of people see everyone who is different as “broken”, “useless” or “someone who needs to be fixed”. Most of the time neuro-atypical voices are not heard and mostly shunned by the louder majority as not valid. Also, Neuro-atypical or neurodivergent means that someone has a brain that functions significantly differently from the dominant majority standards of “normal” and that would include autistic, bipolar, dyslexic people and many other groups. [ASW] Have you had any problems with the project so far? Is there anything particularly fun or exciting that you’ve encountered whilst working on it? [MB] So far I got lots of emails with questions and comments from different people. While I get lots of supportive messages -lots of people have shared my project and pledged to support it – there are also some not so nice people who wrote horrible things to me. I try to understand them, as we live in this so called “cure culture” and those people were dragged into this believe that everyone who is not neurotypical is somehow broken, but it still hurts. The problem is that those people are so obsessed with ABA therapies or organisations like autism speaks, and that they do not want to listen to what others have to say. It’s not surprising, as organisations like autism speaks are the ones that speaks the loudest. [Autism speaks are] sending the message that having autistic children is worse than for them to die; that autism is an epidemic, it’s spreading and we need to stop it. Another kind of people who felt an urgent need to tell me what to do are the people who are actually activists, believing that their cause is the only one that needs to be spoken about. For example someone who calls themselves an animal and human rights activist wrote to me, to tell me that everything I do is wrong; that there is no point of publishing a book on neurodiversity as there are lots of worse things in this world (like wars or animals killed for food). I do not think you can compare one discrimination to another and say which one is worse. Yes, it’s horrible that there are wars. Yes, it’s horrible that animals are killed. But it does not mean that we should stop talking about other things and concentrate only on one single issue campaign. So yeah, the biggest problem I have to deal is other people and their ignorance. [ASW] To what extent do you feel that specifically the animal movement is not very accommodating of neurodiversity? Are there any particular instances of discrimination you have witnessed/experienced? [MB] Unfortunately most of the movements are not really accommodating to the neurodivergent, expecting everyone to change and adapt if they want to be a part rather than involving them and realising that different people have different needs. Often if someone puts an effort to accommodate neuro-atypicals better they make such a big deal out of it, that most of the time you wish they didn’t. There are some horrible examples how animal rights groups and organisations discriminate towards neuro-atypical people and even strengthened the existing stigma. One of the recent ones I’ve seen was a poster [circulating on facebook] asking people to stop using cow’s milk as a way to stop autism. Surprisingly lots of people in comments agreed with the ad, and refused to listen to people who spoke against it, that way contributing to already existing stigma. First of all, the advert had no scientific background – milk does not cause autism, the same as vaccinations do not cause autism. But the most important part is that this ad was sending a message that autism is something we need to get rid off, and telling autistic people that they are not the part of this society by dehumanizing them. Also it assumes that if a person is autistic and vegan, they must be lying about their identity, as they can’t be vegan or else they wouldn’t be autistic, or they are simply not autistic. Also there is huge problem with activists tending not to take the neurodivergent seriously, patronising them and many times talking behind their backs about how everyone who does not act in a way they call socially acceptable is a shame to the movement and brings a bad image to the general public. Why is socially acceptable behaviour so important? Shouldn’t we, as the movement, challenge those rules rather than blindly following them in the hope of getting more support from the general public? [ASW] How can the animal movement become more inclusive of neurodiversity? [MB] It’s important to realise that neuro-atypicals are as much a part of society as neurotypicals are. It was just a coincidence that the majority of the society are NTs (neurotypicals) and it’s no reason to ignore other people’s needs. The animal movement (same as any other) should be welcoming and accepting of people’s background, upbringing, abilities and disabilities. Firstly do not assume that everyone in your group is neurotypical. One of the most important things any movement that would like to be more inclusive could do is to take a step back and actually listen to what neuro-atypical people have to say. Stop assuming what others need or want and listen to what they have to say. Also it’s important not to compare one individual to another (e.g. my friend is autistic, so I know how you feel.) as well as not to assume you know and understand what experiences and feelings the individual has. Please do not patronise people! Many times activists who are aware of the neurodivergent and their differences take a patronising role, believing that they are doing a favour, but they are not. Don’t make a big deal of the things neuro-atyical do differently. Most of the time they are more than aware of that, most of the time they were told that it’s not acceptable, that this is wrong or/and were bullied because of that. Some people need to stim to comfort themselves. Some people need to rock. And they should feel safe and comfortable to do so. Another thing would be stop using ableist language and some of the phrases. Never ever out people as not neurotypical without their conscious agreement. There might be lots of reasons why one does not want others to know and it’s not your place to tell them. Activists should realise that not everyone communicates the same way. For example some people do not develop an ability to communicate using their mouth, but it does not mean that they have nothing to say, they just use different ways of communication! People also process information differently. So it would be a good idea to have some other communication options at the meetings. Also, if you have a plan for a meeting, action or anything really, please stick to the plan! It’s really distressing when plans are changing without notice. Please be aware that! Treat everyone – neurotypical and neurodivergent – with respect. Accepting people, does not make you a heroine, it’s just a decent thing to do. And that’s how it should be. [AW] Thank you Milda, for the interview, and for everything you do! If you haven’t found your way to Milda’s blog yet check out AIWS, where they write more about ableism and neurodiversity. You will also find Milda’s previous projects on there. To support the Kickstarter campaign for a ‘The Girl Who Didn’t Know How to Be’ click here. 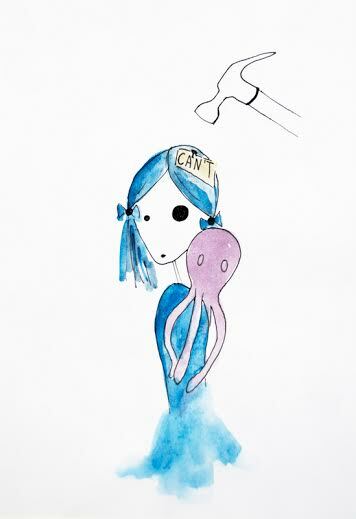 This entry was posted in Text, video and tagged ableism, art, neurodiversity. Bookmark the permalink.